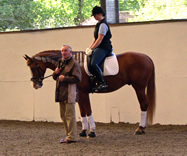 The TTT is an educational foundation, dedicated to the careers of trainers and riders. Throughout the year there is an extensive and comprehensive programme of clinics, lecture/demonstrations and seminars, which take place at East Whipley Farm. The Trust was set up by Tom and Jennifer Sewell at their Farm in Surrey in 1987. They saw talented youngsters who were struggling to build careers whilst making ends meet, but who did not have access to the top-class training they deserved. Tom and Jennifer decided to create a forum for the education of those truly dedicated equestrians, to improve their knowledge, their riding and their teaching skills, all with the best interests of the horse as a guiding principle. The TTT has a Training Ladder which is made up of the following building blocks: Workshops and Seminars, Senior Instructor Clinics and Assessments, International Clinics, Lecture/Demonstrations, and a specific Trainers’ Scheme. We encourage all our members to participate as much as possible in every aspect of the programme, as it is our aim to create an education experience that goes beyond pure “riding lessons”. Membership of the Trust is not confined to Instructors and Judges. It is open to all who are eager to expand their knowledge and skills and to further their understanding of the correct training of horse and rider as practiced by the great Masters of Equitation. The TTT has both Riding and Non-Riding Members and all receive the same welcome. See Membership for details - All our events are also open to non-Members as spectators.